The year was 1984. Pat Keough wanted a break from the corporate world in the Ottawa Valley and thought hiking and photographing Newfoundland’s Gros Morne National Park with his father would be just the thing. At the last minute, though, the trip fell through when his dad backed out, saying heights just weren’t his thing. When a friend suggested Keough instead join him on a whitewater canoe trip along the majestic South Nahanni River in the Northwest Territories, he readily agreed. Rosemarie Czirfusz was running a similar rat race, hers in busy downtown Toronto. Weekends were spent escaping the confines of the city with members of her camera club. The recent university grad had planned a month-long hiking trip to California’s Yosemite National Park California with a friend, but her trip, too, was derailed — the Summer Olympics were taking place in Los Angeles that year and backcountry permits were limited because of the many visitors who would be flocking to the park. Not wanting to miss out on an adventure, Rosemarie took a friend’s advice to instead canoe the South Nahanni River. The two strangers who never should have met — “Pat was planning to hike on the Atlantic, I was planning to hike on the Pacific,” Rosemarie says — found themselves partners in the same canoe, and, over the course of more than 500 kilometres, connected on a much deeper level than either could have imagined. “Our first date was a month in a canoe together,” Pat says. Six weeks later they were engaged and not long after that, they became Mr. and Mrs. Keough — partners in love, life, and some of the most stunningly-captured photography. For almost three decades, while raising their two now-grown children, the pair has travelled the globe, cameras poised, ready to capture the smallest detail or largest vista. 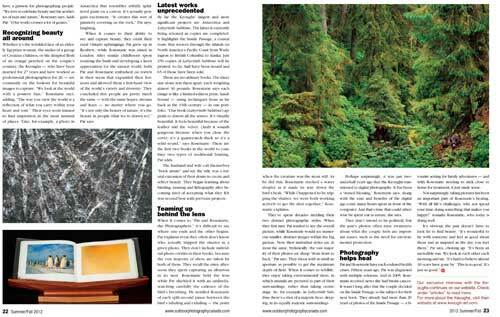 Fans of their nature photography include artist Robert Bateman. The Keoughs reside on Salt Spring Island, BC, where their home is perched atop a hill that affords them a 300-mile view of ocean, islands, lakes, glaciers and volcanoes. (Rosemarie remarks that when they’re 90 they’ll continue to take photos — they’ll just take them from the luxury of their bedroom window.) They’ve published eight books — six coffee-table books and two monumental, limited-edition tomes: Antarctica, and, most recently, Labyrinth Sublime: The Inside Passage. The latter are intricately-crafted, hand-bound books that have garnered attention from around the world. Whether it’s the wrinkled face of an elderly Egyptian woman, the smiles of a group of Croatian children, or the dimpled flesh of an orange perched on the couple’s counter, the Keoughs — who have been married for 27 years and have worked as professional photographers for 26 — are constantly on the lookout for beautiful images to capture. “We look at the world with a positive bias,” Rosemarie says, adding, “The way you view the world is a reflection of what you carry within your heart and soul.” Their eyes seem trained to find inspiration in the most unusual of places. Take, for example, a photo in Antarctica that resembles artfully splattered paint on a canvas. It’s actually penguin excrement. “It creates this sort of painterly covering on the rock,” Pat says, laughing. When it comes to their ability to see and capture beauty, they credit their rural Ontario upbringings: Pat grew up in Renfrew, while Rosemarie was raised in London. After similar childhoods spent roaming the bush and developing a keen appreciation for the natural world, both Pat and Rosemarie embarked on travels in their teens that expanded their horizons and allowed them a first-hand view of the world’s variety and diversity. They concluded that people are pretty much the same — with the same hopes, dream and fears — no matter where you go. 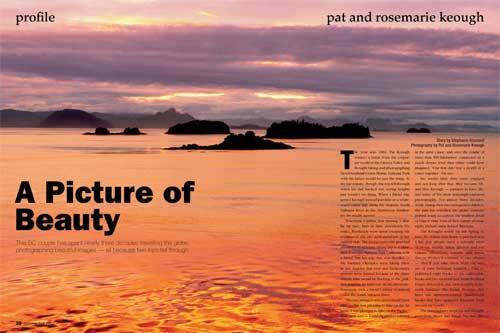 “It’s not only the beauty of nature, it’s the beauty in people (that we’re drawn to),”	Pat says. By far the Keoughs’ largest and most significant projects are Antarctica and Labyrinth Sublime. The latter is currently being released as copies are completed. It highlights the Inside Passage, a coastal route that weaves through the islands on North America’s Pacific Coast from Washington to British Columbia to Alaska. Just 250 copies of Labyrinth Sublime will be printed. So far, half have been bound and 65 of those have been sold. These are no ordinary books. The sheer size alone sets them apart, each weighing almost 30 pounds. Rosemarie says each image is like a limited-edition print, hand- bound — using techniques from as far back as the 15th century — in one portfolio. “Our book (Labyrinth Sublime) appeals to almost all the senses. It’s visually beautiful. It feels beautiful because of the leather and the velvet. (And) it sounds gorgeous because when you close the cover, it’s a quarter-inch thick so it’s a solid sound,”says Rosemarie. These are the first two books in the world to combine two types of traditional binding, Pat adds. The husband and wife call themselves “book artists” and say the title was a natural extension of their desire to create and reflect beauty. They began learning about binding, tanning and lithography after becoming tired of accepting what they felt was second best with previous projects. 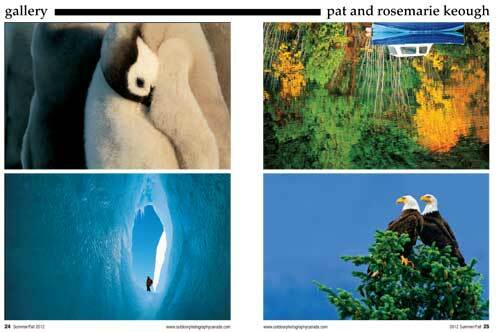 When it comes to “Pat and Rosemarie, the Photographers,” it’s difficult to say where one ends and the other begins. Pat explains even they often don’t know who actually tripped the shutter in a given photo. They don’t include individual photo credits in their books, because the vast majority of shots are taken by both of them. They recall the rainy afternoon they spent capturing an albatross in its nest. Rosemarie held the lens while Pat shielded it with an umbrella, watching carefully the cadence of the bird’s breathing. He notified Rosemarie of each split-second pause between the bird’s inhaling and exhaling — the point when the creature was the most still. As he did this, Rosemarie tracked a water droplet as it made its way down the bird’s beak. “While I happened to be tripping the shutter, we were both working actively to get the shot together,” Rosemarie explains. They’ve spent decades melding their two distinct photographic styles. When they first met, Pat tended to see the overall picture, while Rosemarie would see numerous smaller, abstract images within the big picture. Now their individual styles are almost the same. Stylistically, the vast majority of their photos are sharp “from front to back,” Pat says. They shoot with as small an aperture as possible to get the maximum depth of field. When it comes to wildlife, they enjoy taking environmental shots, in which animals are pictured as part of their surroundings, rather than taking centre stage. So, for example, in Labyrinth Sublime there’s a shot of a majestic bear, sleeping, in its equally majestic surroundings. Perhaps surprisingly, it was just two-and-a-half years ago that the Keoughs transitioned to digital photography. It has been a “mixed blessing,” Rosemarie says. Along with the ease and benefits of the digital age come many hours spent in front of the computer. And that’s time that could otherwise be spent out in nature, she says. They don’t intend to be political, but the pair’s photos often raise awareness about what the couple feels are important issues, such as the need for environmental protection. Pat and Rosemarie have each endured health crises. Fifteen years ago, Pat was diagnosed with multiple sclerosis. And in 2005, Rosemarie received news she had breast cancer. It wasn’t long after that the couple decided on the Inside Passage as the subject for their next book. They already had more than 20 years of photos of the Inside Passage — a favourite setting for family adventures — and with Rosemarie needing to stick close to home for treatment, it just made sense. Not surprisingly, taking pictures has been an important part of Rosemarie’s healing. “With all life’s challenges, why not spend your time doing something that makes you happy?” remarks Rosemarie, who today is doing well.